CS-SUNN/PACFaH as part of its mandate to support the scale up of nutrition in Nigeria recently supported the Ministry of Budget and National Planning (MBNP) to convene a one day quarterly meeting in Lagos State to strengthen the coordination of National Committee on Food and Nutrition (NCFN). Deputy Director, Food and Nutrition, Ministry of Budget and National Planning, Mrs Roselyn Gabriel commended CS-SUNN and Alive and Thrive and other partners for supporting the programme which creates a forum for the NCFN to show case best practices, monitor nutrition activities at state level and replication of activities from the National at the states. She also commended the Kaduna State government for adopting best practices in addressing the menace of malnutrition saying they scored over 82% in the ministry’s scorecard, urging them to share their experiences for other state governments to learn. Update on progress from Lagos State Committee on Food and Nutrition by Abayomi Kadiri revealed that the Lagos state governor has approved the presentation of a three-year nutrition roadmap to relevant stakeholders with a budgetary allocation of N16, 650,500 for all nutrition activities in year 2017 for the state. Mrs. Phobe Sukai Yayi of the Kaduna state Ministry of Budget and National Planning relayed implementation progress, opportunities and way forward as well as challenges to the implementation of nutrition interventions in the state. “Kaduna has trained over 109 CMAN TOTs, approved N 10million for the implementation of MNCHW plus a budget line for nutrition in the state. Also 31,346 children now have access to CMAM services” she said. The Ministry of Science and Technology’s PSO Mrs. Oyetola Toyosi told the meeting that of the sum of N 9,571,674.00 budgeted for the promotion of Safe Practices on Utilization of Herbicides/ Pesticides Used in Foodstuff Preservation in two (2) Geo-Political Zones (NW, SW) only N 4,500,000 has been released. Mrs. Elizabeth Ugoh, spokesperson of the Ministry of Water Resources, said the Hand Washing & Hygiene Promotion program across six states for which 3.7 million was budgeted, is at a 100% implementation stage. Mrs. Omoluwubi Mogekwu from the Ministry of Health’s Public Service Office, reported that training of Data Collectors on SBCC for MNP, Pretesting of MNP SBCC materials in Kebbi and Adamawa states as well as Training of Trainers on Micronutrient Powder (MNP) Materials in Kaduna have been 100% implemented, adding that plans are underway to Revitalize Baby Friendly Hospitals across the country.
. Sharing of best practices (Kaduna State as a case study) for replication in challenged states and MDA’s.
. 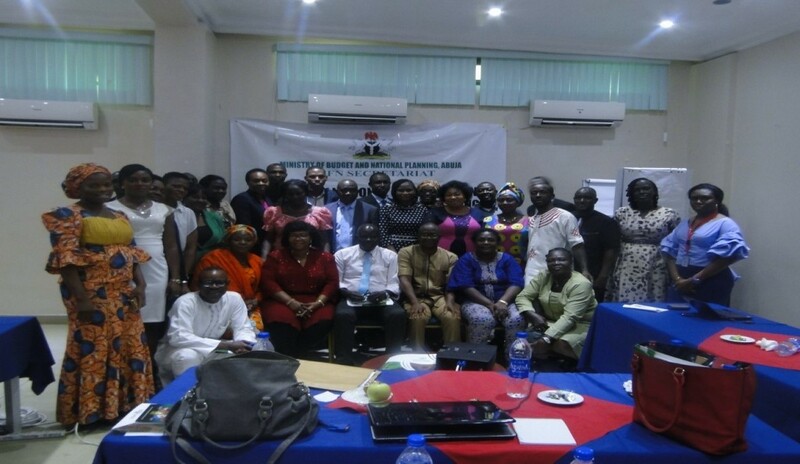 Rationalization and mobilization of activities and resources for scaling up Nutrition via Partners, States and stakeholders support.
. Assessment of progress and achievements of SCFN in the last quarter.
. Development of strategies to institute more proactive nutrition interventions by stakeholders to deliver more results in 2017.